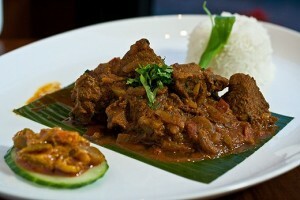 Bhuna Gosht recipe by Mariam at DesiRecipes.com. Cut meat into 1/2 inch pieces. Put onions, garlic , salt , chili powder, ground coriander, turmeric and meat in a heavy based pot. cook for 15 to 20 minutes, or until the meat is half cooked. Add tomatoes, and ginger in meat and cook for 5 minutes, stir all the time to mash tomatoes. Add oil and cook for 5 to 10 minutes, keep stirring all the time. You may have to add one or two Table spoons of water to prevent gravy sticking to the bottom of the pot. When the gravy begins to release the oil, the meat reaches the bhuna stage. Now it is almost tender and a little cooking is required to finish the dish. The cooking time depends upon the vegetable or lentil .Some vegetables are soft ,like okra and zucchini , and cook quickly.These kind of vegetables can be added directly to meat mixture (bhuna gosht) and cook them for 10 minutes. Some vegetables and lentils take time to be cooked. In such case take out the meat pieces from the gravy. Add vegetable or lentil , when it is almost cooked add meat pieces, and cook for few minutes. I tried this last night for dinner. It did came out good. Thank you for the recipe. one tablespoon of oil is ok but you can increase or decrease second time you make it. I like it sounds good but one thing i did't get you said 12 tsp chili powder? are you sure? i love it and all family member's really admired that recipe. plz try this one to keep happy your family.